South Korean President Moon Jae-in heads for Washington Wednesday, where he will meet with U.S. President Donald Trump on Thursday. Moon said previously he hoped his trip to the United States will revitalize stalled talks with North Korea that collapsed after Trump and North Korean leader Kim Jong Un failed to reach an agreement during their February summit in Hanoi. 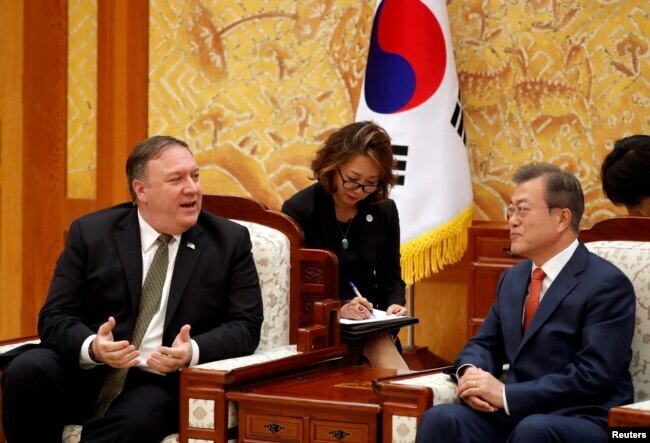 U.S. Secretary of State Mike Pompeo talks with South Korean President Moon Jae-in during their meeting at the presidential Blue House in Seoul, South Korea, Oct. 7, 2018.